Technology as a form has evolved much and has created much influence in the realm of communication. One such element of technology that really has pushed the communication is the video conferencing. You simply cannot ignore the immense benefits that videoconferencing is bringing to the business and to the world. Initiating the face to face meetings with the people in different locations is astonishing – it helps the business to enhance the productivity whilst saving operational costs. With the advanced video conferencing systems, the business can have dynamic person to person meetings, can have live presentations, share documents – though you are in different parts of the world. Simply the technology is astounding. But choosing the right video conferencing system is tricky. Understanding and identifying the benefits in implementing the systems will help you come to a conclusion. Once the requirements and benefits are identified, it is fine to get the support from a right provider who can assist you from designing phase to implementation phase. Go with the Yealink Video conferencing systems. Yealink is widely acclaimed as the leading provider offering wide range of video, audio and collaboration experience solutions. Yealink Video Conferencing System in Dubai have been designed to integrate easily with various server platforms which can be used with any communication environment. Yealink delivers cutting edge video conferencing solutions categorized by high quality, rich features, good user experience, easy placement and cost effective performance. These solutions help business enterprises to enhance communication efficiency and to reduce communication costs. Yealink’s video conferencing solutions enable the business to enjoy the meetings over network environments and on various devices with the comprehensive support. With the solutions, you never feel that you are having the communication over the network, instead it makes the feeling as if you are in a live meeting – thus making the human connection livelier regardless of the distance. Yealink VC120-12X is the latest advanced high resolution (1080P) full HD video conferencing systems designed for medium sized meeting rooms. It’s highly “easy to nature” and high quality makes it favorable for the small to medium businesses. Its support to feature like the “bandwidth dynamic adaptive adjustment” makes it more consistent and reliable for the video conferencing solution. The users can enjoy 8-lines with 720P resolution with the multipoint license and the linkage to mobile connection facility for a smooth and convenient video conferencing solution. Brilliant user experience: This system make use of its resources for delivering a brilliant user experience. For example, whilst on the call you can adjust the screen layout as per your wish and intelligent searching. High interoperability: It supports the SIP and the compression technology H.323.It is compatible with the industry leading vendors, thus delivering cost effectiveness and flexibility. Yealink VC 120 , 18X video conferencing system, has been designed to provide the users with exceptional video conferencing facilities. It supports an intelligent firewall traversal that makes the life easier. Its support to feature like the “bandwidth dynamic adaptive adjustment” makes it more consistent and reliable for the video conferencing solutions. The users can enjoy 8-lines with 720P resolution with the multipoint license and the linkage to mobile connection facility for a smooth and convenient video conferencing solution. Yealink VC400 Video Conference System ia an innovative and latest video conferencing solution has been designed specifically for the head office use. It supports SIP Dual protocol to make sure good compatibility with the main video conferencing systems. As well it support the compression technology H.323. In this version, the users’ can enjoy 8 party video conferencing with high resolution of 720P. It supports dual displays, USB recording and playback with a brilliant audio video experience. When it comes to the video conferencing solution for your business then VC400 is the good choice. High definition Video: The system offers multipoint video conferencing (up to four other participants). It also supports full-HD dual stream to demonstrate documents or videos. High definition Voice: it has been equipped with the features to support 360 degree voice pick up and other professional voice processing technologies. 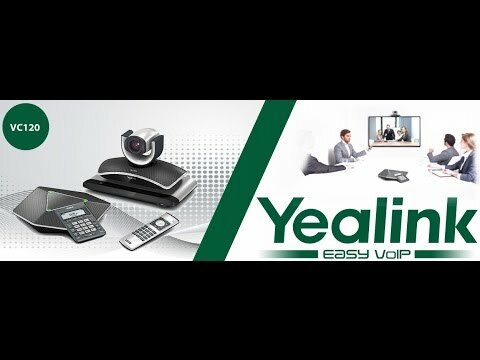 Yealink VC110 Video Conference System is ideal for small meeting rooms in branch offices.The VC110 is designed as an all in one solution with a high degree of performance and a very good value.It an easy to adapt solution for companies companies looking for ease, simplicity and accessibility in driving visual communication in smaller venues arrangements. Yealink VC110 is a healthy choice for today’s executives looking to strategically and competitively Conferencing System. Wireless Micpod : Yealink has taken user’s conferencing experience one step further with the VCM60 Wireless Micpod. Used in conjunction with the VC110, the VCM60 enables you to place a microphone in the optimal location for crystal-clear audio pickup. HD Video :The system supports full HD voice and video functionality, enabling users to streamline operations and processes with crisp, clear documents, videos and more. Optimal HD Voice : The Yealink VC110 boasts 14kHz CD level broadband, as well as a number of leading-edge professional voice processing technologies such as guaranteeing users a superb audio experience. Yealink Windows desktop and Mobile app is the latest addition to Yealink’s innovative One-stop Video Conferencing Solution.These conferencing applications are mainly for the people who work in the office, in business travel or at home.It offer high-quality, best-in-class high definition (HD) video collaboration program created to streamline communication for today’s businesses. Yealink VC Mobile being compatible with iOS 8.0, Android 4.4 or later.As a new and very innovative product, Yealink VC Mobile is the ideal partner for you to have a mobile and HD video conferencing.